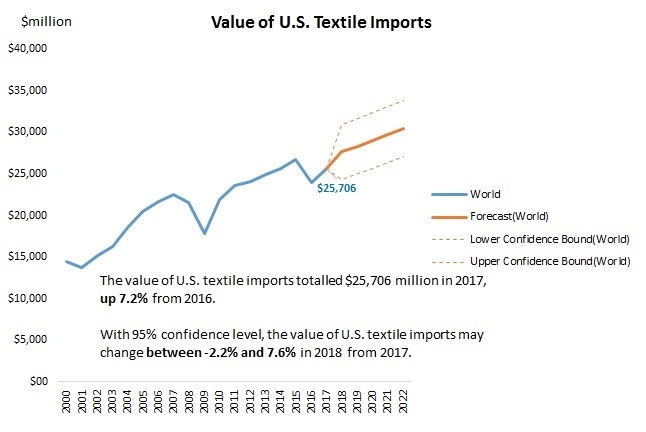 The value of U.S. textile imports reached $25,706 million in 2017, up 7.2 percent from 2016 and 77.8 percent from 2000. 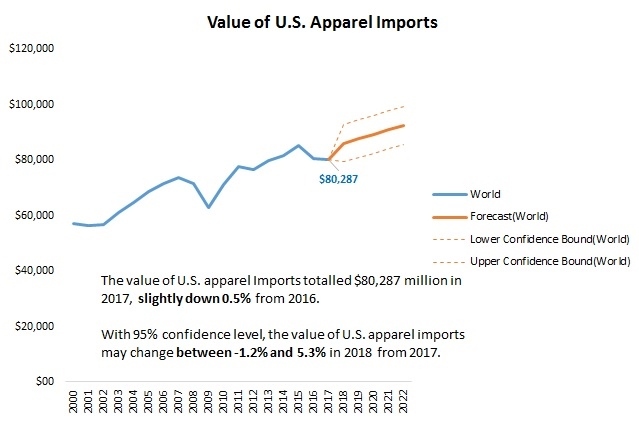 The value of U.S. apparel imports reached $80,287 million in 2017, slightly down 0.5 percent from a year earlier and up 40.3 percent from 2000. It is estimated that the value of U.S. textile and apparel imports could change between -2.2% and 7.6% and between -1.2% and 5.3% respectively in 2018. 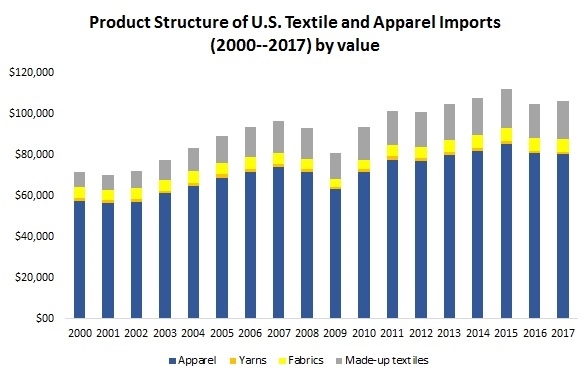 Because the United States is no longer a major apparel manufacturer but one of the largest apparel consumption markets in the world, apparel products accounted for 75.7 percent of total U.S. textile and apparel imports in 2017, followed by made-up textiles (17.4 percent), fabrics (5.7 percent) and yarns (1.2percent). This structure has remained stable over the past decade. The U.S. imported apparel from as many as 150 countries in 2017. 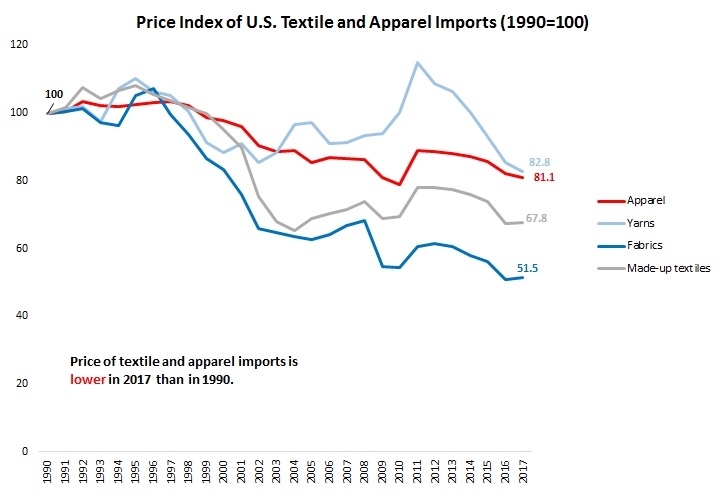 Meanwhile, the Herfindahl index declined from 0.17 in 2010 to 0.15 in 2017, suggesting that overall the U.S. apparel import market is becoming less concentrated. This result is consistent with some recent studies, which show that U.S. fashion brands and retailers continue to diversify their sourcing bases gradually. 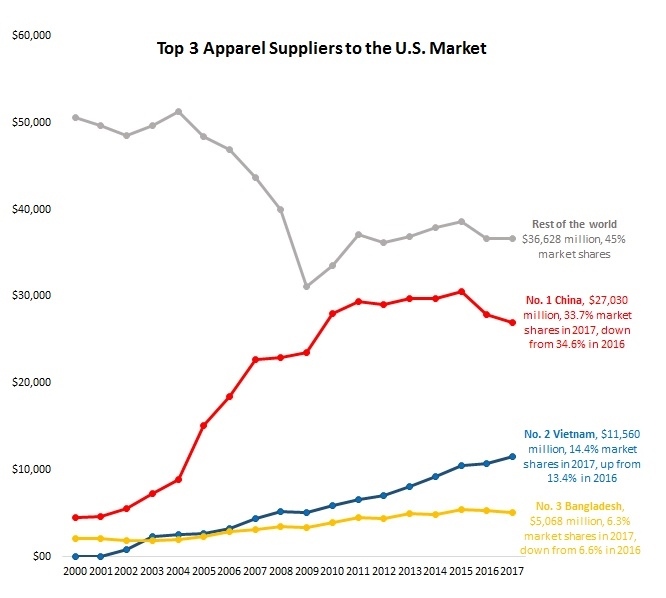 Specifically, all top apparel suppliers to the United States in 2017 (by value) were developing countries and most of them are located in Asia, including China (33.7 percent), Vietnam (14.4 percent), Bangladesh (6.3 percent), Indonesia (5.7 percent), India (4.6 percent) and Mexico (4.5 percent). U.S. textile and apparel imports are also becoming even cheaper. For example, U.S. apparel imports in 2017 on average was only 81.1 percent of the price in 1990 and the price of imported fabrics cut nearly by half over the same period. Additionally, U.S. apparel imports overall mirror the pattern of apparel retail sales in the U.S. market. This pattern reflects the fact that the performance of the U.S. economy is the leading factor shaping the size of demand for imported apparel. 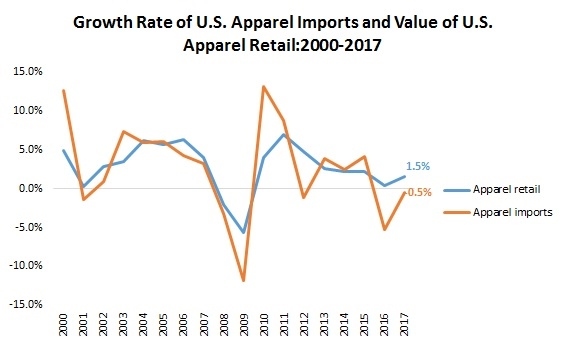 Notably, between 2010 and 2017, the value of U.S. apparel imports grew relatively faster than the value of U.S. apparel retail sales (3.2 percent vs 3.1 percent annually on average). The result suggests that a growing share of apparel products consumed in the United States now come from overseas. According to the newly released World Trade Statistical Review 2017 by the World Trade Organization (WTO), the current dollar value of world textiles (SITC 65) and apparel (SITC 84) exports totaled $284 billion and $443 billion respectively in 2016, marginally decreased by 2.3 percent and 0.4 percent respectively from a year earlier. This is the second year in a roll since 2015 that the value of world textiles and apparel exports grew negatively. However, textiles and apparel are not alone. The current dollar value of world merchandise exports also declined by 3 percent in 2015, to $11.2 trillion, mostly caused by the strong decline in exports of fuels and mining products (-14 percent). On the other hand, as noted by the WTO, the steep drop in commodity prices recorded in 2015 mostly halted in 2016, except energy prices. 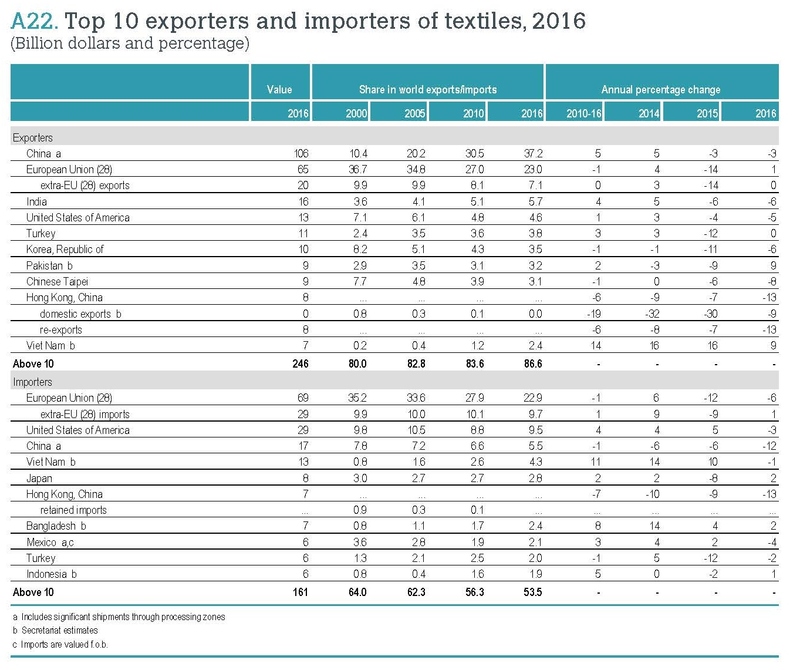 Measured in value, China, European Union, and India remained the top three exporters of textiles in 2016. Altogether, these top three accounted for 65.9 percent of world exports in 2016, slightly down from 66.5 percent in 2015, which is mostly due to India’s shrinking market shares. The United States remained the fourth top textile exporter in 2016, accounting for 4.6 percent of the shares (down from 4.8 percent in 2015). Over half of the top ten exporters experienced a decline in the value of their exports in 2016, with the highest declines seen in Hong Kong (-13 percent), Taiwan (-8 percent), South Korea (-6 percent) and the United States (-6 percent). Notably, Vietnam entered the world’s top ten textile exporters for the first time (2 percent market shares, 9 percent growth rate from 2015). 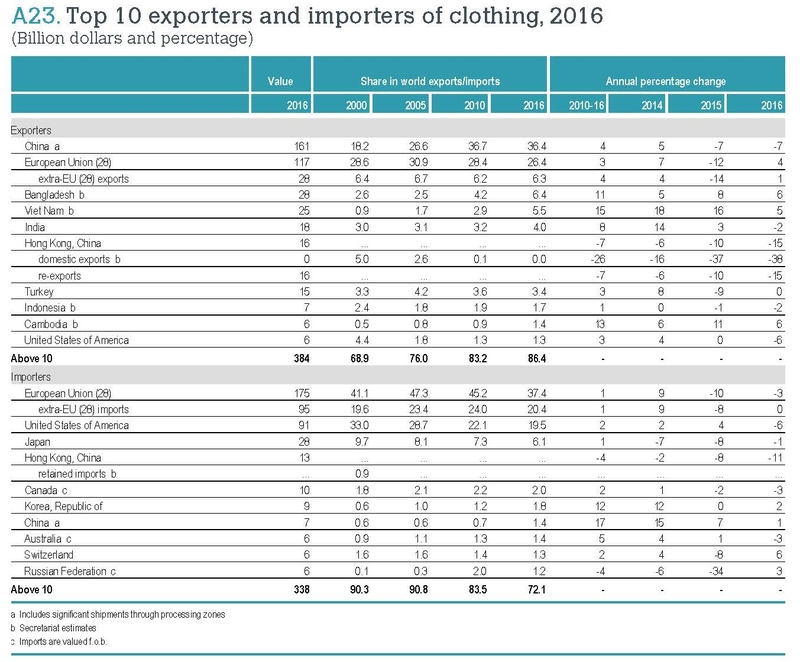 Top three exporters of apparel include China, the European Union, and Bangladesh. Altogether, they accounted for 69.1 percent of world exports, close to 70.3 percent in 2015. 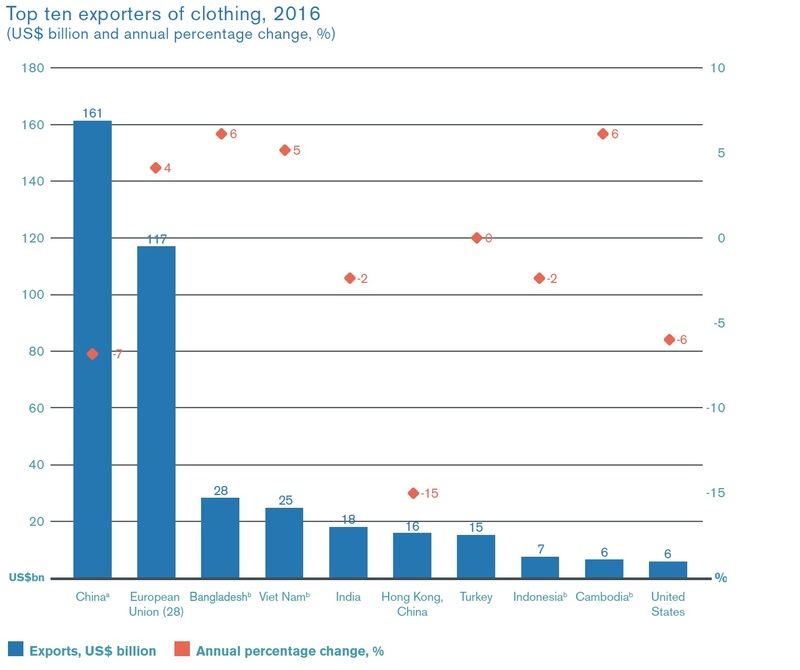 Among the top ten exporters of apparel, increases in export values were recorded by Cambodia (+6 percent), Bangladesh (+6 percent), Vietnam (+5 percent), and European Union (+4 percent). Other leading exporters saw stagnation in their export values (such as Turkey) or recorded a decline (such as China, India, and Indonesia). Could be negatively affected by the rising labor and production cost, China’s shares in the world textile exports dropped from 37.4 percent in 2015 to 37.2 percent in 2016, and the shares in the world apparel exports fell from 39.2 percent in 2015 to 36.4 percent in 2016—a record low since 2010. Measured in value, the European Union, the United States, and China were the top three importers of textiles in 2016. These top three altogether accounted for 38 percent of world textile imports, slightly up from 37 percent in 2015, but remains much lower than over 53 percent back in 2000. 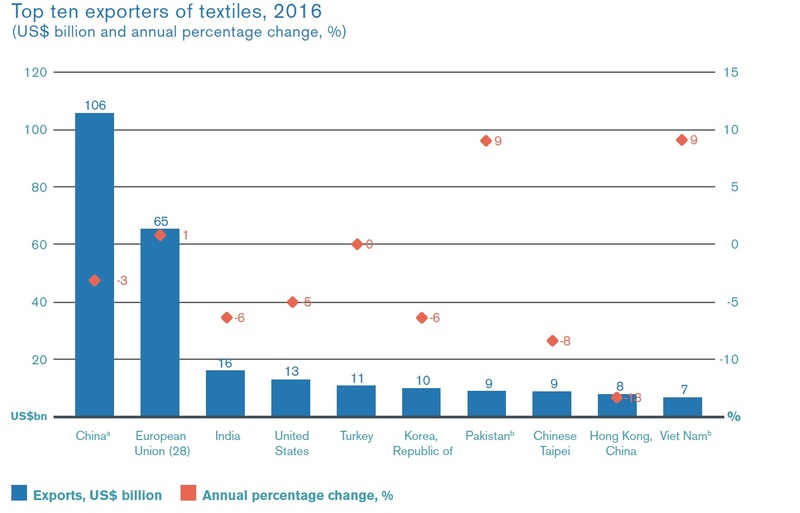 Notably, over the past decade, apparel manufacturing continues to shift from developed to developing countries and many developing countries heavily rely on imported textile inputs due to the lack of local manufacturing capacity. This explains why more textile exports now go to the developing nations. On the other hand, affected by consumers’ purchasing power (often measured by GDP per capita) and size of the population, the European Union, the United States, and Japan remained the top three importers of apparel in 2016. Altogether, these top three accounted for 62.9 percent of world apparel imports in 2016, up from 59 percent in 2015. Notably, China is quickly becoming one of the world’s top apparel importers. From 2010 to 2016, China’s apparel imports enjoyed an annual 17 percent growth, much higher than most other countries.